1-abc.net Password Organizer - Manage your private login and password data! In these days, everyone has many different passwords, to login to a messenger or an e-mail account, security codes for online banking, PINs for his telephone and so on. 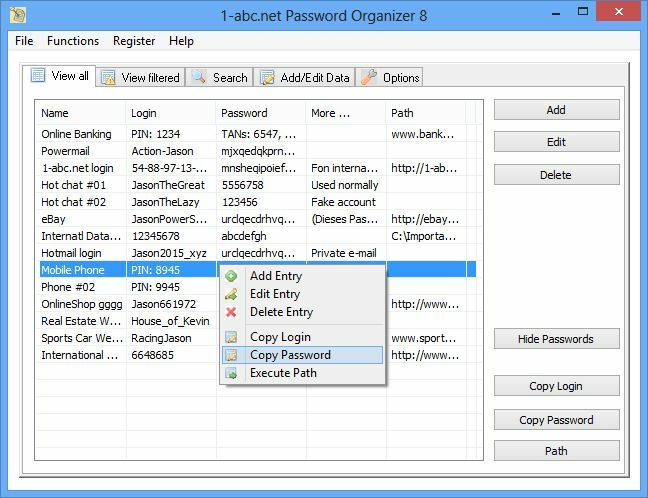 1-abc.net Password Organizer allows you to organize all your passwords and login data, you only have to remember your master password. Since it is no good idea in general to use bithdays of your family members, names of famous polititians or your favourite sports team as a password on the one hand but anything else is not so easy to remember on the other, 1-abc.net Password Organizer allows you to generate passwords on a random base that nobody would think about. If you want to have fast access to your password data, there are also many useful features inside this program: You can define a path that should be executed just with one click which could be an executable file or your favourite program for example. You can also enter a website here, which would make sense if you would like to login to any password protected online service like eBay or Twitter. And if you do not want to copy and paste your data each time you need it, you can also use global hotkeys for it.